Stephanie is a top rated Magician in Massachusetts. entertains you and your guests. equipment so all you need do is provide the space. neat and clean when she leaves. No fuss just Magic. Record the moments and share for a life-time. Stephanie wants you to take photos and videos. you wish to ensure you have a special moment captured. These shows are tailored for the age of the birthday person. Silly and goofy for kids. Shows for the older crowd are fun, energetic with lots of audience participation. All shows will highlight the birthday person making that person the center of the event. 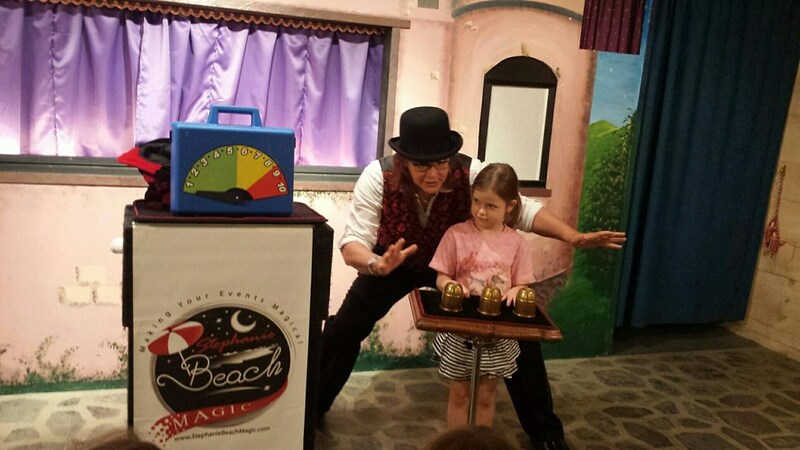 Bring Magic right into your home with a private Magic show for your family and Friends. you have created a special event for everyone. These shows are designed for families. They are fun with lots of audience participation. This will make an evening at home quite Magical. A magical event will show you care about your customers and Clients. 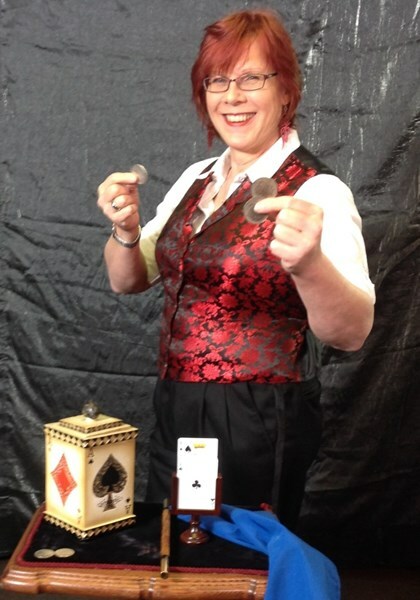 Magic is a great way to promote your business or bring in new customers. in your business. They always come back for more magic. for a stage show, Stephanie will create a show just for you. Lawrence Mass Boating Community, Music Makers of Acton, YMCA, Boys and Girls Club and many more. These companies have all called Stephanie Beach Magic back for more magic. * Stephanie currently has public shows throughout the year at the Drawbridge Theater in Lunenburg Ma. View her Current Events page for locations and times of events. Stephanie was great! The kids AND adults loved her! We all enjoyed the show! Stephanie was amazing. All the kids were very entertained and she did an amazing job including kids especially the birthday girl into the show. Very satisfied and would highly recommend. Stephanie was PHENOMENAL with the children. She had children engaged and had them participate. Can't say enough. Highly recommend her for any child's party. Stephanie went far beyond my expectations. 1) She traveled outside of her normal radius to perform for us. 2) She did not confine her talent to the predesignated show time. While the audience was eating brunch, she went around to the various tables in the hall, performing for small groups of enthusiastic children and their parents. Everyone loved her! 3) Because our show was a fundraiser for a youth group, she did a fantastic job of including each of the girls in that group. 4) The actual show was the perfect blend of humor, tricks, music, and did I mention humor? Her ventriloquist act had people laughing so hard they couldn't breathe. THANK YOU, STEPHANIE! Stephanie was great. The residents truly enjoyed her performance..
Great experience. 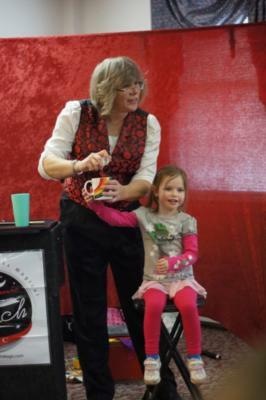 She was able to keep 40 children (5 year olds) and 4O adults engaged the entire show. It was fantastic. She came early she set up she interacted with the children until her time to set up the kids loved her she put on a show and the kids really enjoyed she will be hired again for my next parry great job !! She was amazing! All the kids and adults had a great time! I had the party for my 6 year old twins and she included them in most of the tricks. Also included their big brother and the other kids at the party! I would highly recommend her! Stephanie was great! We hired her for our daughters sweet 16 birthday party and she made the party a huge success. Despite the shy nature of the audience she was able to draw them into the show. By the end all the girls were jumping at the chance to participate in the illusions. The girls and parents are still talking about it weeks later. IT TRULY WAS ONE OF THE MOST ENJOYABLE ENTERTAINING DAYS BOTH FOR THE KIDS AND THE GROWNUPS. something I WOULD HIGHLY RECOMMEND FOR EVERYONE TO DO FOR UPCOMING PARTIES. It was definitely the biggest highlight of the day. Thank you Stephanie from all of us. Please note Stephanie Beach Magic will also travel to Westford, Acton, Boxborough, Ayer, Devens, Boxboro, Village of Nagog Woods, Harvard, Groton, Carlisle, Maynard, Concord, Still River, Shirley, Dunstable, Stow, West Groton, Shirley Center, Kates Corner, North Chelmsford, Chelmsford, North Billerica, Tyngsboro, Bolton, Pepperell, Nutting Lake, Bedford, Lowell, Hudson, Lancaster.